Posted by Editor at 5:42 PM . Alvi qualified for participation in the upcoming BFAME Zonal Championship 2019 after emerging triumphant in the national bridge trials for open team conducted at the Aslam Bridge Hall, housed in the National Stadium, Karachi. 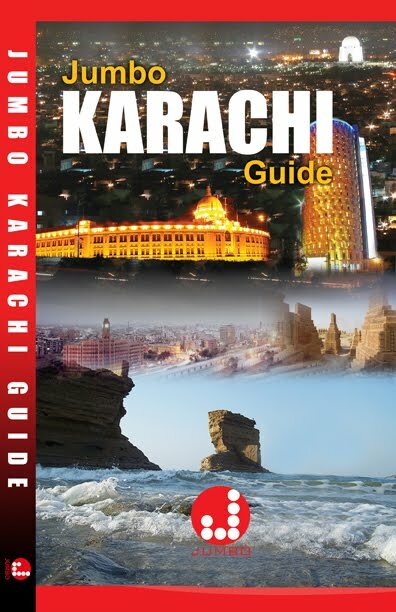 According to the details shared by the Karachi Bridge Associates (KBA) on April 10, Alvi, comprising of Farooq Alvi, Jahangir Ahmed, Arslan Mansoor, Hamed Mohiuddin, Muhammad Mubashir Puri and Khaled Mohiuddin, outsmarted all their six rivals in the four-day event. They will now represent Pakistan in the BFAME Championship due to be held in June at Jordan. Kizilbashing, featuring Anwar Mumtaz Kizilbash, Ali Hai, Zia Hai, Anis-ur-Rehman and Farhat Abbas, crashed in the final while Bilal, having the services of Gulzar Ahmed Bilal, Sheikh Abdul Muqeet, Javed Ahmed Miran, Shahin Iqbal and Masood Mazhar, and Spel, containing Muhammad Salman Qasim, Yasser Rahim, Mirza Shauq Hussain, Imran Abedi, Ahsan Javed Qureshi and Zia Hyder Naqi, were outwitted in the semifinals. The trials for selection of the open team had commenced on April 6 and concluded on April 9. Seven teams participated in the trials from Karachi, Lahore and Islamabad, the three major centres of the country, who were engaged in the brainy warfare. Bilal, Alvi, Kizilbashing and Spel had entered the semifinals after the preliminary round matches. Kizilbashing outpaced Spel and Alvi outplayed Bilal in the semifinals and Alvi was up against Kizilbashing in the final. Alvi, having the representation from Karachi, Islamabad and Lahore, started the final with a bang, winning the opening segment 70-38. They capitalized on the grand start and went on to win the following two segments as well with the final scores being Alvi 156-141 Imps. Tehseen, having Hasan Askari, Tehsin Gheewala, Parvez Mirza, Farrukh Liaquat, Mohsin Chandna and Rashid-ul-Ghazi, Chandna, possessing Shakeel Ahmed Chandna, Major Akhter Zaidi, Syed Abdul Hameed, Col Nasir, Syed Asghar Abbas Zaidi and Ghulam Mohammad, and Romex, fielding Shahid Rafique, Shafiq Janjua, Rashid Nabi and Sajid Nabi, were the other three participating team in the national trials. Posted by Editor at 4:29 PM . The Chairman of the Pakistan Veterans Cricket Association (PVCA), Fawad Ijaz Khan, has declared that Nadeem Omar, the owner of Quetta Gladiators, was the difference among the otherwise evenly matched six participating squads in the recently held fourth edition of the Pakistan Super League (PSL). 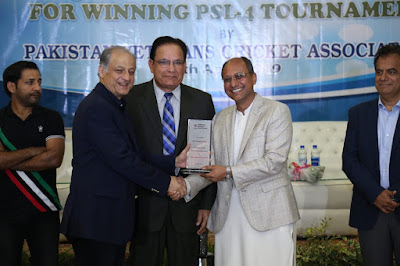 “His motivational qualities played the key role in guiding his team to title victory this time round after they had been edged out in the final two times in three previous editions of the PSL,” he observed during his speech in the dinner hosted at the Karachi Gymkhana on April 8 by the PVCA in the honour of Quetta Gladiators for winning the PSL-4. “Each of the six teams contained power hitters and match winners. 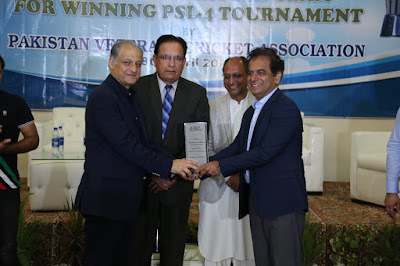 But it was the management skills and the incredible passion of its owner which tilted the tide decisively towards Quetta Gladiators,” the PVCA Chairman added. Inspired by the terrific response from the spectators in Karachi during the PSL-4, urged the authorities to either build a new stadium or enhance the seating capacity of the National Stadium to facilitate the passionate cricket lovers of the most populous city of Pakistan. Saeed Ghani, Sindh Minister for Local Government, Public Health Engineering, Rural Development and Katchi Abadies, who was the chief guest of the evening, acceded to the request of the PVCA Chairman and agreed to play his role in developing more cricket facilities in the metropolis. Encouraged by successfully staging the Karachi leg of the PSL, the Government of Sindh has agreed in principle in developing more facilities for fuelling the passion of the cricket-loving population of the metropolis. Saeed Ghani confirmed the willingness of the provincial government to further play its role in the promotion of cricket, the number one sport of the country. 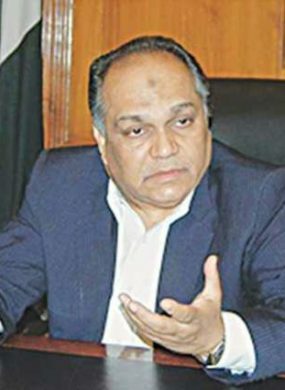 Sharing his thoughts candidly, the provincial minister talked about the hardships and the challenges faced by the provincial government in staging as many as eight matches of PSL-4 in Karachi without a single mishap. 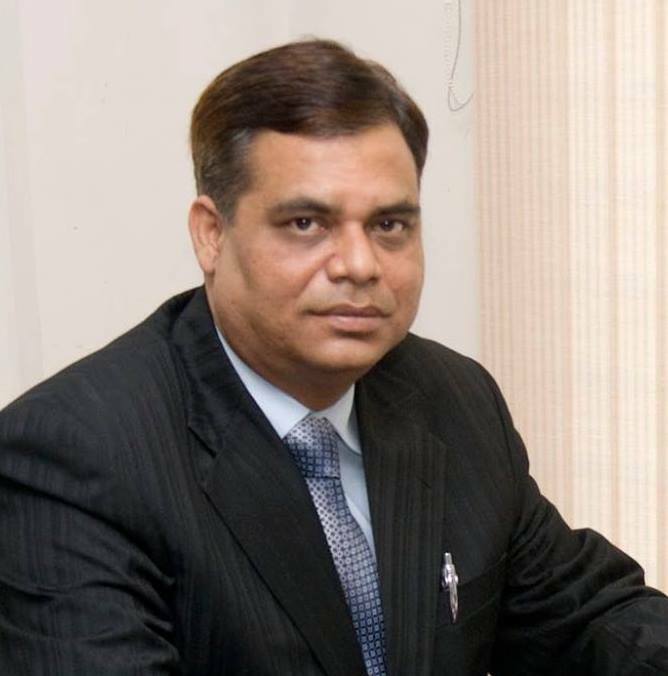 He complimented the law enforcement agencies and the city administration in particular for rising to the occasion. The Commissioner Karachi, Iftikhar Ali Shallwani, also spoke about the organizational aspects of the PSL-4 and he acknowledged the support of all the stakeholders in making the event a big success. 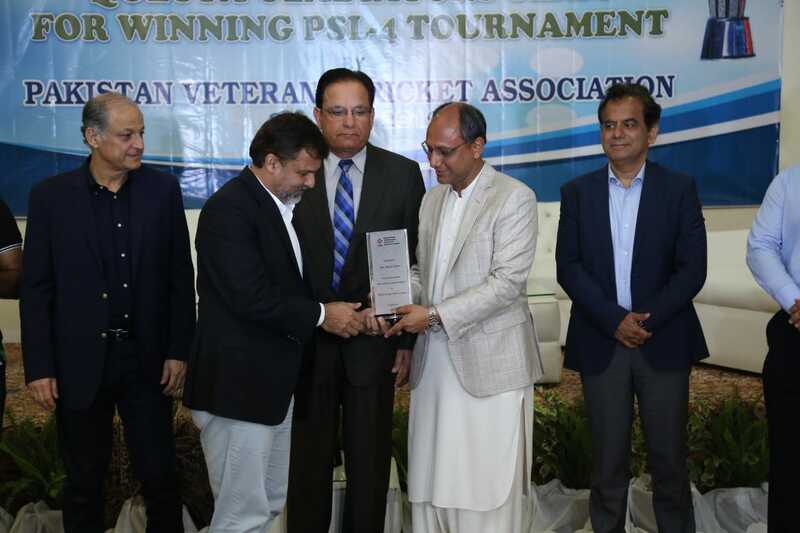 Nadeem Omar, the owner of Quetta Gladiators and the President of the Karachi City Cricket Association (KCCA), attributed the recent triumph of his team in the PSL as a result of teamwork rather than individual brilliance. “We have been firm believers of teamwork. We have been operating like an extended family all along and the results have been there for everyone to see. It’s little wonder that ours has been the most consistent side in the PSL even though many people felt that we didn’t have too many megastars in our ranks,” he observed. Nadeem Omar made special mention of his family members for having been involved with Quetta Gladiators with heart and soul to keep everyone motivated and inspired. 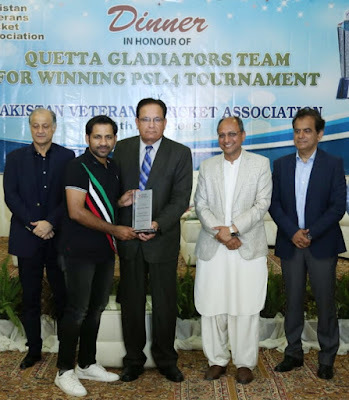 The Quetta Gladiators skipper, Sarfraz Ahmed, who is also the captain of Pakistan in all three formats, in his brief speech, thanked everyone in the team for having given their best to achieve the desired results. Former Pakistan captain and now the head coach of Quetta Gladiators, Moin Khan, expressed similar views and he was even more appreciative of the role of the management and the support staff in the success of the team on the field. Alamgir Ahmed, President, Sindh Seniors Cricket & Welfare Association, delivered the welcome address. The ceremony was attended by a large number of cricketers and others which included Nasim-ul-Ghani, Wasim Bari, Sadiq Muhammad, Ijaz Faqih, Jalaluddin, Mansoor Akhtar, Anwar Ali, Rashid Khan, Ghulam Ali, Sajid Ali, Prof Siraj-ul-Islam Bukhari, Prof Ejaz Ahmed Farooqui, Shariq Hasib Khan, Qamar Ahmed, Lt Gen (Rtd.) Wasim Ghazi, Asad Ashraf Malik, Fawad Malik and Azam Khan. Posted by Editor at 12:02 AM . 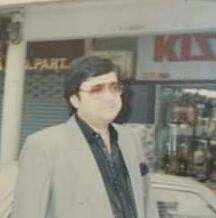 The Chairman of the Pakistan Billiards & Snooker Association (PBSA), Ali Asghar Valika, expects Pakistan’s cueists to bring home more laurels as they prepared to leave the shores of the country to participate in the second stage of the ACBS/IBSF Asian Tour Snooker Tournament being held under the auspices of the Asian Confederation of Billiards Sports (ACBS) with the blessings of the International Billiards & Snooker Federation (IBSF). According to the details made available by the PBSA Secretariat, the trio of Muhammad Bilal, Babar Masih and Haris Tahir was set to fly out from Lahore to Jinan, China, on October 26. The event is being hosted by the Chinese Billiards & Snooker Association (CBSA) from October 28 to 31. The total prize money the event will be U$$40,000 with the winner to receive US$12,000 and the runner-up to get US$6,000. The top 24 cueists which include the IBSF and regional snooker players will participate in this tour, together with the Asian champions of 2018. The Pakistan players have qualified in this ACBS/IBSF Asian Tour of 2018 on the basis of their performances in the ACBS events of 2018. Muhammad Bilal was the losing semifinalists in the Asian Snooker Championship 2018 while Babar Masih was the losing semifinalist in Asian 6-Red Snooker Championship 2018 and Haris Tahir ended as the runner-up in the Asian Under-21 Snooker Championship 2018. 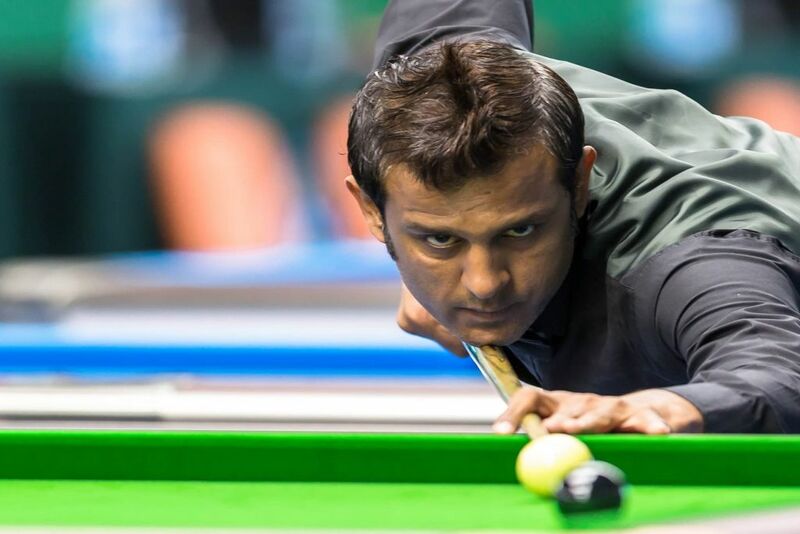 The PBSA Chairman reckoned that Muhammad Bilal, one of the premier cueists of the country, has made Pakistan proud by having emerged triumphant in the opening round of the event, staged at the QBSF Snooker Academy in Doha, Qatar, from September 26 to 29, which earned a handsome purse of US$12,000 with the trophy. “Bilal has got off to a dream start in the Asian Tour Event and he has a golden chance of emulating his feat. He has shown that he can handle the pressure of big matches and here is another opportunity for him to collect a fabulous purse again,” Asghar Valika observed in a brief chat at the Karachi Club Annexe. “Bilal’s performance is a source of inspiration to the whole lot. The confidence of Babar and Haris has been boosted by the title win of Bilal in Doha and they can make it count in the Chinese city of Jinan. I wish all three the best of luck,” the PBSA Chairman concluded. Posted by Editor at 10:08 PM . Behbud Secondary School thrashed GBSS Anglo Oriental School by nine wickets in their Group F fixture of the 9th PVCA/EBM Inter-School Cricket Tournament 2018 at the Naya Nazimabad Cricket Stadium, Karachi, on October 17. The tournament, featuring 32 schools of Karachi, is being organized by the Pakistan Veterans Cricket Association (PVCA) and sponsored by English Biscuit Manufacturers (EBM), the makers of the famed Peek Freans biscuits. GBSS Anglo Oriental School, who opted to bat first, lost wickets at regular intervals to be bowled out for 152 all out in 35.overs despite the contribution of as many as 44 extras. Opener Muhammad Ramiz, who made a solid 22 off 41 balls, was their only batsman to offer resistance as the innings was rocked by the spin duo of Tayyab Khan (3-26) and Akhtar Ali (2-35). Behbud Secondary School’s skipper Akhtar Ali, opening the innings, then blasted a breezy 33 off 15 balls to give his team a flying start to the chase of 153. He was declared Man of the Match as the pair of Sagheer Khan (52 off 69 balls) and Hasan Raza (35 off 66 balls) added 106 runs for the unbroken second wicket partnership which took their team over the line in 24.5 overs. Posted by Editor at 10:05 PM . Happy Palace School outsmarted Beaconhouse School System by seven wickets in their Group F fixture of the 9th PVCA/EBM Inter-School Cricket Tournament 2018 at the Asghar Ali Shah Stadium, Karachi, on October 17. The tournament, having the participation of 32 schools of Karachi, is being organized by the Pakistan Veterans Cricket Association (PVCA) and sponsored by English Biscuit Manufacturers (EBM), the makers of the famed Peek Freans biscuits. Beaconhouse School System, choosing to bat first, was routed for 135 in 32.2 overs despite Ghulam Mustafa’s 41 off 40 balls. They were undone by left-arm spinner Abdul Rafay, who returned the figures of four for 24 off 7.2 overs as the last six wickets tumbled for only 41 runs. Happy Palace School didn’t encounter much problems in chasing down the modest target of 136 in 40 overs. They needed only 25.5 overs to do it with opener Furqan Shakil, who was adjudged Man of the Match, striking three sixes and five fours in his 68 off 72 balls. He dominated the 69-run second wicket stand with Mohsin Khan, who returned undefeated on 29 off 39 balls. The Happy Palace bowlers toiled hard but they could not change complexion of the game. Posted by Editor at 10:01 PM . Skipper Abdullah Khan’s century and Farhan Zaman’s five-wicket haul enabled Oasis English School to hammer Qamar-e-Bani Hashim School by 182 runs in their Group E fixture of the 9th PVCA/EBM Inter-School Cricket Tournament 2018 at the Eastern Star Cricket Ground, Karachi, on October 17. A total of 32 schools of Karachi, divided equally in eight groups for the preliminary rounds, are contested the tournament being organized by the Pakistan Veterans Cricket Association (PVCA) and sponsored by English Biscuit Manufacturers (EBM), the makers of Peek Freans. Batting first, after calling correctly, Oasis English School posted a formidable total of 287 for six in the allotted 40 overs which was largely made possible by Abdullah Khan (115 off 102) and Sharjeel Ahmed (85 off 60 balls) who added 140 for the second wicket. Anis Moghul’s unbeaten 39 off 42 ensured that Oasis English School played out their full quota of overs, after being shaken by off-spinner Faris Hussain who captured three wickets in quick succession. Chasing a target of 288 in 40 overs, Qamar-e-Bani Hashim School struggled from the outset after losing wickets upfront. Even Kazim Hussain’s 35 off 36 balls could not revive their hopes as they were bundled out for 145 in 20.3 overs. Left-arm spinner Farhan Zaman wrecked the innings with the figures of five for 39 but Man of the Match award was clinched by his captain Abdullah Khan for his century. Posted by Editor at 11:38 PM . Muhammad Yaqoob’s terrific all-round show earned Fahad Academy 44-run triumph over KBV-CAA School in a Group D fixture of the 9thPVCA/EBM Inter-School Cricket Tournament 2018 at the Asghar Ali Shah Stadium, Karachi, on October 16. Muhammad Yaqoob followed up his fluent knock of 67 down the order with a magnificent five-wicket haul with his leg-spin to lead Fahad Academy to a comfortable victory in the end. He was adjudged Man of the Match. Fahad Academy, who batted first after calling correctly, found themselves in dire straits with the top half of their batting back in the hut cheaply despite opener Zeeshan Ahmed’s fluent 39 off 32 balls. At 82 for six they seemed in danger of being bowled out cheaply but Muhammad Yaqoob rescued them with his 60-ball 67 containing one six and five fours. Fahad Academy was eventually bowled out for 200 in 32.3 overs with the bowling honours shared between KBV-CAA School’s pace trio of Zain-ul-Abedin (3-38), Ahmed Raza (2-36) and Haris Abid (2-43). The 93-run second wicket partnership between opener Muhammad Maaz (63 off 97 balls) and Asad Majeed (33 off 66 balls) put KBV-CAA School in the driving seat but they were derailed by Muhammad Yaqoob who finished with the excellent figures of five for 29. Off-spinner Muhammad Shaheryar (2-20) also bowled well as KBV-CAA School was bowled out for 156 in 34 overs despite the contribution of 34 extras.